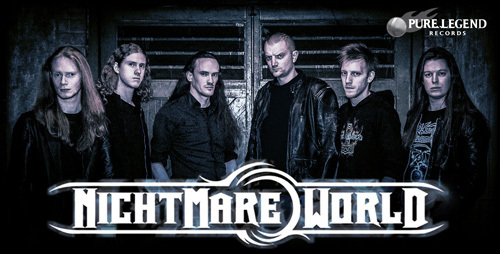 Nightmare World is a not so new metal band from England. Formed nearly ten years ago with Pete Morten (Threshold, My Soliloquy) on vocals, they released an EP, No Regrets, in 2009, but then fell silent. There's much to be said for perseverance. This year, they finally release a full-length album, In The Fullness Of Time on Pure Legend Records. The Nightmare World sound can be narrowed down to a combination traditional melodic heavy metal merged with power metal, with some slight prog nuances. Being from the UK, one might look at the first part of that description and think Iron Maiden and others of that time and genre. Maybe so, but I find their sound falls into the wide lake of European power metal. Either way, this means that Nightmare World works the basic elements of melody and harmony, whether by vocal arrangements or twin guitar riffs and leads, a sometimes swift rhythm section, and light intrigue in the arrangements. And it all works rather well for them. The album consists of the three songs from the earlier EP: The New Crusade, No Regrets, and Euphoria. No, I don't know if these are fresh recordings of them. The remainder, six songs, are original to the album. I recall on first spin having the feeling that I've been there, done this before. In this sense, as said above, this is straight forward melodic power metal. Expectations were average at the start, but eventually the band sparked some interest. Notable were the guitar lines: harmonious, sharp at time, with an abundance of good leads. Brisk and sharp guitar references can be found in Burden of Proof, a definite guitar-centered song. Within the quiet anthem, The Ever Becoming, they take the road of subtle and smooth lines, going from acoustic riffs to electric leads. As for arrangements, for those wanting the gallop of power metal, you'll find it with The New Crusade, Euphoria, and more or less in In Memoria Di Me. Alternatively, Nightmare World will play with tempos within No Regrets and Defiance. The former has some of those sharp riffs, but sways between rock groove and gallop in the pace and rhythm. Defiance is quite heavy, especially in the bottom end, and can seem to plod along, but the brisk riffs and leads after the midpoint liven things up. Perhaps the most intriguing song here is Damage Report. Like the preceding The Ever Becoming, the atmosphere is quieter than most other songs, with piano over symphonic orchestration at the start and after the midpoint. In between and after the guitars rise and leads come. The song is an example of one that is best heard than explained. Unfortunately, I can't play it for you. Fundamentally, Nightmare World's In The Fullness Of Time was worth the wait of six years in the works: it's a solid, interesting, and entertaining album of melodic power metal, with a few surprises. Hopefully, we won't have to wait so long for their next accomplishment. Recommended. Nightmare World's In The Fullness Of Time was worth the wait of six years in the works: it's a solid, interesting, and entertaining album of melodic power metal, with a few surprises. Hopefully, we won't have to wait so long for their next accomplishment. Recommended.